Not to be confused with VH1 Behind the Scenes...here is PeaceLoveMom Behind the Scenes! It is about 104 degrees in our warehouse - even with those big fans. We are shinning because we are sweating! Cynthia really does wear great jewelry everyday. She has a great sense of style. Me on the other hand, I don't think I brushed my hair. Frank is "Mr. PeaceLoveMom" We all call him that because he is the best sport in town. Even on our 20th ink change, he never gets frustrated. Can you imagine how many times he hears us say "can we try one more?" Miss Lorraine has been with us since day 1. She is our color compass and our confidence builder. Lupe does it all..burns the screens, mixes our inks, and runs the press. He never says no and he is so fast. This was a small glimpse into our world. 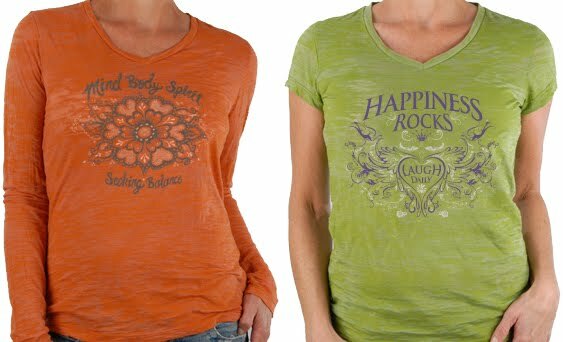 We hope you get a sense of how much pride and hard work goes into creating a PeaceLoveMom tee. Let us know if there is a "behind the PeaceLoveMom scenes" you want to know about. We are thrilled to have you Celebrate with us! It wouldn't be complete without the Happy Birthday Song! We want to sincerely thank you all for your support, encouragement, and just plain ole good wishes. Celebrating Motherhood with our customers is an amazing experience and we are truly grateful. To all our customers everywhere: We raise our piece of cake in your honor & toast to you...I know you were expecting something a little stronger, but after all it is lunch time here at our warehouse and we still have carpool to do today. We will save the bottles of Mumm Napa for year 5 & hopefully we will be able to toast you in person! Wearing these, FYI —that's Lori's body. She is the model/partner. * How does one get a size 7 foot out of their mouth on live TV? * If I embarrass our company, can my partner Lori fire me? * Does the camera really add 10 lbs. or did I really eat all that candy at the trade show? * Did they offer to do my make-up because they do it for everyone or do they think I need a little extra help? Kidding aside, we are thrilled and honored. Please tune in!